Home Markets FOREX AUD – Ready to Pop on RBA? 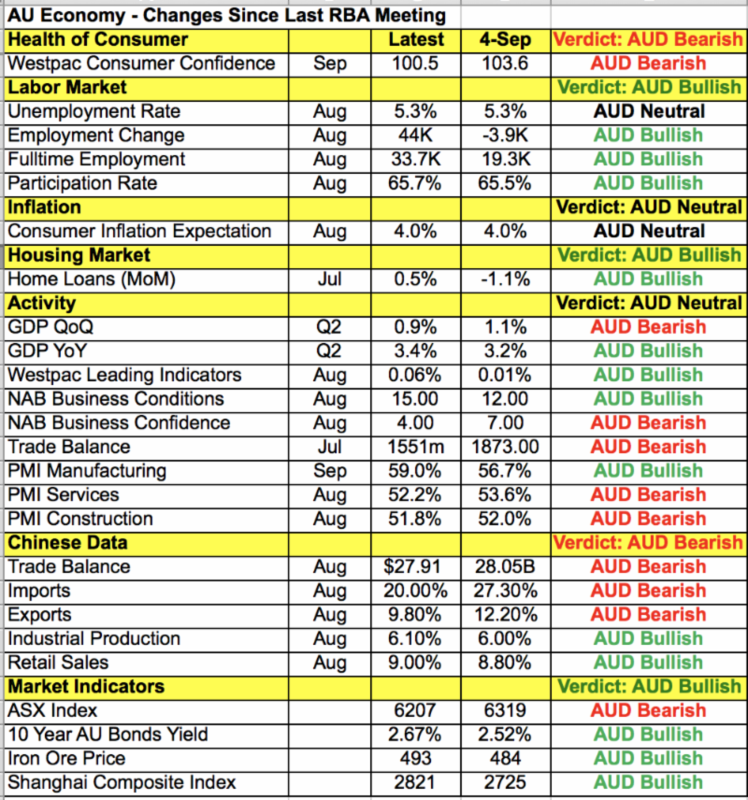 AUD – Ready to Pop on RBA? The big story in the FX market was the U.S.-Canada trade deal. In the eleventh hour, the 2 neighboring countries managed to secure a deal that will be known as the US-Mexico-Canada Agreement (USMCA for short). This agreement should be enough to end months of uncertainty and the pave the way for an interest rate hike as quickly as this month. At the end of last week, before the trade deal was finalized investors were already pricing in a 90% of an October move. Today, those odds increased to 96% – which means the market basically sees a guaranteed hike. Last week’s GDP report confirmed that the economy is performing well and earlier in the week, Bank of Canada Governor Poloz said uncertainty shouldn’t prevent rate hikes. Now that this uncertainty has been lifted, the value of USD/CAD could start to reflect the odds of tightening. We see the pair falling to at least the May lows around 1.2740 especially with Canadian bond yields soaring and oil prices rising to its highest level since 2014. Canada’s IVEY PMI and labor market reports are due later this week but unless they are abysmal, they should not affect the BoC’s decision to normalize monetary policy by raising interest rates in the very near future. Speaking of rate decisions, the RBA has a monetary policy announcement this evening. Unlike the BoC they have no plans to raise interest rates this year. They are comfortable with staying neutral especially in light of slower manufacturing activity in China and US-China trade tensions. However most of Australia’s problems are external. As shown in the table below, there’s been a good amount of improvements in Australia’s economy since the last policy meeting. Overnight we learned that manufacturing activity accelerated significantly in the month of September with inflation ticking upward as well. These improvements have helped the Australian dollar trade higher ahead of the RBA rate decision. These reports tell us that the central bank doesn’t need to be overly concerned about China’s troubles. The only real problem was the recent mortgage rate hike but so far the impact has been limited (or at least we aren’t seeing evidence of it yet). If the RBA is neutral we could see AUDUSD pop up to .7250-.73 cents but in the long run, the trend for AUD/USD should be lower as interest rate differentials continue to move against the pair. Regardless of the reaction to the RBA, what’s more important is the fact that monetary policy will remain steady in Australia for the rest of the year and with the Fed expected to tighten again, the downtrend in AUD/USD should remain intact. Retail sales, the PMI manufacturing and services reports are also scheduled for release. By now, no one should be surprised to see sterling jockeyed around by Brexit headlines. This is a big week for the UK with the Tory Party Conference underway that will end with an important speech by Prime Minister May on Wednesday. Today, GBP/USD soared above 1.31 on the back of reports that May is “preparing to make a significant new Brexit offer to the European Union in an attempt to open the door to a deal.” The Irish border is the main issue blocking progress and maybe she finally willing to concede for full access to the customs union. However the sharp reversal in GBP/USD shortly thereafter tells us that investors are skeptical. Either way, we’ll know on Wednesday, when we’ll undoubtedly see a big move in GBP. Meanwhile data was good with mortgage approvals and manufacturing activity increasing. Housing data is due for release tomorrow and similar improvements are anticipated. All of these domestic factors were more important than US data. Although manufacturing activity and construction spending slowed more than expected, the greenback extended its gains against the Japanese Yen, euro and Swiss Franc. It sold off versus the sterling, Canadian and Australian dollars. There are a lot of US economic reports and Fed speak on this week’s calendar that could affect dollar trade but as long as the data isn’t terrible, the greenback could extend its gains. Comments from Fed President Kashkari and Rosengren were also slightly dollar bearish with Kashkari (who is typically a dove) saying there’s no reason to move rates up and tap on brakes. Rosengren feels that the economy is performing well but he doesn’t think there’s a need to quicken the pace of tightening. There’s no US data due for release tomorrow but Fed Vice Chair Quarles will be speaking in the morning with Fed Chair Powell talking after the bell. Euro extended its losses against the greenback for the fourth consecutive trading session. Downward revisions to EZ PMIs and the fear that Italy will be downgraded by one of the major rating agencies are keeping the currency under pressure. Its good news that Italian Economy minister Tria denies plans to resign but that doesn’t seem to be enough to reassure investors and stem the slide in EUR/USD. Italian bond yields continued to rise today as the longer term consequences of Italy’s budget give investors a reason to bail out of Italian assets.